How can we make a computer conscious? This is very text heavy and is really just my thinking out loud, so to speak. Unless you are into mental archaeology or masochistic, I’d strongly recommend that you instead go to my new blog on this which outlines all of the useful bits graphically and simply. I found this article in my drafts folder, written 3 years ago as part of my short series on making conscious computers. I thought I’d published it but didn’t. So updating and publishing it now. It’s a bit long-winded, thinking out loud, trying to derive some insights from nature on how to make conscious machines. The good news is that actual AI developments are following paths that lead in much the same direction, though some significant re-routing and new architectural features are needed if they are to optimize AI and achieve machine consciousness. Let’s start with the problem. Today’s AI that plays chess, does web searches or answers questions is digital. It uses algorithms, sets of instructions that the computer follows one by one. All of those are reduced to simple binary actions, toggling bits between 1 and 0. The processor doing that is no more conscious or aware of it, and has no more understanding of what it is doing than an abacus knows it is doing sums. The intelligence is in the mind producing the clever algorithms that interpret the current 1s and 0s and change them in the right way. The algorithms are written down, albeit in more 1s and 0s in a memory chip, but are essentially still just text, only as smart and aware as a piece of paper with writing on it. The answer is computed, transmitted, stored, retrieved, displayed, but at no point does the computer sense that it is doing any of those things. It really is just an advanced abacus. An abacus is digital too (an analog equivalent to an abacus is a slide rule). A big question springs to mind: can a digital computer ever be any more than an advanced abacus. Until recently, I was certain the answer was no. Surely a digital computer that just runs programs can never be conscious? It can simulate consciousness to some degree, it can in principle describe the movements of every particle in a conscious brain, every electric current, every chemical reaction. But all it is doing is describing them. It is still just an abacus. Once computed, that simulation of consciousness could be printed and the printout would be just as conscious as the computer was. A digital ‘stored program’ computer can certainly implement extremely useful AI. With the right algorithms, it can mine data, link things together, create new data from that, generate new ideas by linking together things that haven’t been linked before, make works of art, poetry, compose music, chat to people, recognize faces and emotions and gestures. It might even be able to converse about life, the universe and everything, tell you its history, discuss its hopes for the future, but all of that is just a thin gloss on an abacus. I wrote a chat-bot on my Sinclair ZX Spectrum in 1983, running on a processor with about 8,000 transistors. The chat-bot took all of about 5 small pages of code but could hold a short conversation quite well if you knew what subjects to stick to. It’s very easy to simulate conversation. But it is still just a complicated abacus and still doesn’t even know it is doing anything. However clever the AI it implements, a conventional digital computer that just executes algorithms can’t become conscious but an analog computer can, a quantum computer can, and so can a hybrid digital/analog/quantum computer. The question remain s whether a digital computer can be conscious if it isn’t just running stored programs. Could it have a different structure, but still be digital and yet be conscious? Who knows? Not me. I used to know it couldn’t, but now that I am a lot older and slightly wiser, I now know I don’t know. Consciousness debate often starts with what we know to be conscious, the human brain. It isn’t a digital computer, although it has digital processes running in it. It also runs a lot of analog processes. It may also run some quantum processes that are significant in consciousness. It is a conscious hybrid of digital, analog and possibly quantum computing. Consciousness evolved in nature, therefore it can be evolved in a lab. It may be difficult and time consuming, and may even be beyond current human understanding, but it is possible. Nature didn’t use magic, and what nature did can be replicated and probably even improved on. Evolutionary AI development may have hit hard times, but that only shows that the techniques used by the engineers doing it didn’t work on that occasion, not that other techniques can’t work. Around 2.6 new human-level fully conscious brains are made by nature every second without using any magic and furthermore, they are all slightly different. There are 7.6 billion slightly different implementations of human-level consciousness that work and all of those resulted from evolution. That’s enough of an existence proof and a technique-plausibility-proof for me. Sensors evolved in nature pretty early on. They aren’t necessary for life, for organisms to move around and grow and reproduce, but they are very helpful. Over time, simple light, heat, chemical or touch detectors evolved further to simple vision and produce advanced sensations such as pain and pleasure, causing an organism to alter its behavior, in other words, feeling something. Detection of an input is not the same as sensation, i.e. feeling an input. Once detection upgrades to sensation, you have the tools to make consciousness. No more upgrades are needed. Sensing that you are sensing something is quite enough to be classified as consciousness. Internally reusing the same basic structure as external sensing of light or heat or pressure or chemical gradient or whatever allows design of thought, planning, memory, learning and construction and processing of concepts. All those things are just laying out components in different architectures. Getting from detection to sensation is the hard bit. So design of conscious machines, and in fact what AI researchers call the hard problem, really can be reduced to the question of what makes the difference between a light switch and something that can feel being pushed or feel the current flowing when it is, the difference between a photocell and feeling whether it is light or dark, the difference between detecting light frequency, looking it up in a database, then pronouncing that it is red, and experiencing redness. That is the hard problem of AI. Once that is solved, we will very soon afterwards have a fully conscious self aware AI. There are lots of options available, so let’s look at each in turn to extract any insights. The first stage is easy enough. Detecting presence is easy, measuring it is harder. A detector detects something, a sensor (in its everyday engineering meaning) quantifies it to some degree. A component in an organism might fire if it detects something, it might fire with a stronger signal or more frequently if it detects more of it, so it would appear to be easy to evolve from detection to sensing in nature, and it is certainly easy to replicate sensing with technology. Essentially, detection is digital, but sensing is usually analog, even though the quantity sensed might later be digitized. Sensing normally uses real numbers, while detection uses natural numbers (real v integer as programmer call them). The handling of analog signals in their raw form allows for biomimetic feedback loops, which I’ll argue are essential. Digitizing them introduces a level of abstraction that is essentially the difference between emulation and simulation, the difference between doing something and reading about someone doing it. Simulation can’t make a conscious machine, emulation can. I used to think that meant digital couldn’t become conscious, but actually it is just algorithmic processing of stored programs that can’t do it. There may be ways of achieving consciousness digitally, or quantumly, but I haven’t yet thought of any. That engineering description falls far short of what we mean by sensation in human terms. How does that machine-style sensing become what we call a sensation? Logical reasoning says there would probably need to be only a small change in order to have evolved from detection to sensing in nature. Maybe something like recombining groups of components in different structures or adding them together or adding one or two new ones, that sort of thing? So what about detecting detection? Or sensing detection? Those could evolve in sequence quite easily. Detecting detection is like your alarm system control unit detecting the change of state that indicates that a PIR has detected an intruder, a different voltage or resistance on a line, or a 1 or a 0 in a memory store. An extremely simple AI responds by ringing an alarm. But the alarm system doesn’t feel the intruder, does it? It is just a digital response to a digital input. No good. How about sensing detection? How do you sense a 1 or a 0? Analog interpretation and quantification of digital states is very wasteful of resources, an evolutionary dead end. It isn’t any more useful than detection of detection. So we can eliminate that. OK, sensing of sensing? Detection of sensing? They look promising. Let’s run with that a bit. In fact, I am convinced the solution lies in here so I’ll look till I find it. Let’s do a thought experiment on designing a conscious microphone, and for this purpose, the lowest possible order of consciousness will do, we can add architecture and complexity and structures once we have some bricks. We don’t particularly want to copy nature, but are free to steal ideas and add our own where it suits. A normal microphone sensor produces an analog signal quantifying the frequencies and intensities of the sounds it is exposed to, and that signal may later be quantified and digitized by an analog to digital converter, possibly after passing through some circuits such as filters or amplifiers in between. Such a device isn’t conscious yet. By sensing the signal produced by the microphone, we’d just be repeating the sensing process on a transmuted signal, not sensing the sensing itself. Even up close, detecting that the microphone is sensing something could be done by just watching a little LED going on when current flows. Sensing it is harder but if we define it in conventional engineering terms, it could still be just monitoring a needle moving as the volume changes. That is obviously not enough, it’s not conscious, it isn’t feeling it, there’s no awareness there, no ‘sensation’. Even at this primitive level, if we want a conscious mic, we surely need to get in closer, into the physics of the sensing. Measuring the changing resistance between carbon particles or speed of a membrane moving backwards and forwards would just be replicating the sensing, adding an extra sensing stage in series, not sensing the sensing, so it needs to be different from that sort of thing. There must surely need to be a secondary change or activity in the sensing mechanism itself that senses the sensing of the original signal. That’s a pretty open task, and it could even be embedded in the detecting process or in the production process for the output signal. But even recognizing that we need this extra property narrows the search. It must be a parallel or embedded mechanism, not one in series. The same logical structure would do fine for this secondary sensing, since it is just sensing in the same logical way as the original. This essential logical symmetry would make its evolution easy too. It is easy to imagine how that could happen in nature, and easier still to see how it could be implemented in a synthetic evolution design system. Such an approach could be mimicked in natural or synthetic evolutionary development systems. In this approach, we have to feel the sensing, so we need it to comprise some sort of feedback loop with a high degree of symmetry compared with the main sensing stage. That would be natural evolution compatible as well as logically sound as an engineering approach. This starts to look like progress. In fact, it’s already starting to look a lot like a deep neural network, with one huge difference: instead of using feed-forward signal paths for analysis and backward propagation for training, it relies instead on a symmetric feedback mechanism where part of the input for each stage of sensing comes from its own internal and output signals. A neuron is not a full sensor in its own right, and it’s reasonable to assume that multiple neurons would be clustered so that there is a feedback loop. Many in the neural network AI community are already recognizing the limits of relying on feed-forward and back-prop architectures, but web searches suggest few if any are moving yet to symmetric feedback approaches. I think they should. There’s gold in them there hills! So, the architecture of the notional sensor array required for our little conscious microphone would have a parallel circuit and feedback loop (possibly but not necessarily integrated), and in all likelihood these parallel and sensing circuits would be heavily symmetrical, i.e. they would use pretty much the same sort of components and architectures as the sensing process itself. 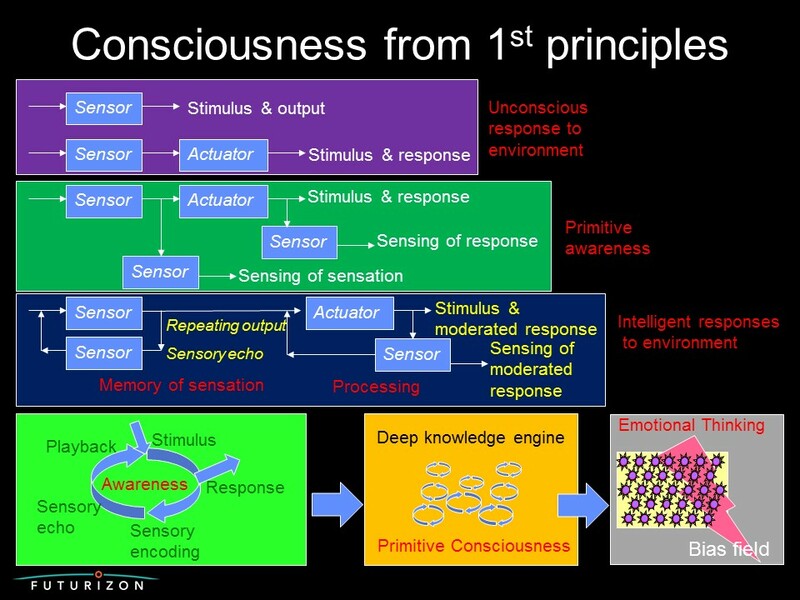 If the sensation bit is symmetrical, of similar design to the primary sensing circuit, that again would make it easy to evolve in nature too so is a nice 1st principles biomimetic insight. So this structure has the elegance of being very feasible for evolutionary development, natural or synthetic. It reuses similarly structured components and principles already designed, it’s just recombining a couple of them in a slightly different architecture. Another useful insight screams for attention too. The feedback loop ensures that the incoming sensation lingers to some degree. Compared to the nanoseconds we are used to in normal IT, the signals in nature travel fairly slowly (~200m/s), and the processing and sensing occur quite slowly (~200Hz). That means this system would have some inbuilt memory that repeats the essence of the sensation in real time – while it is sensing it. It is inherently capable of memory and recall and leaves the door wide open to introduce real-time interaction between memory and incoming signal. It’s not perfect yet, but it has all the boxes ticked to be a prime contender to build thought, concepts, store and recall memories, and in all likelihood, is a potential building brick for higher level consciousness. Throw in recent technology developments such as memristors and it starts to look like we have a very promising toolkit to start building primitive consciousness, and we’re already seeing some AI researchers going that path so maybe we’re not far from the goal. So, we make a deep neural net with nice feedback from output (of the sensing system, which to clarify would be a cluster of neurons, not a single neuron) to input at every stage (and between stages) so that inputs can be detected and sensed, while the input and output signals are stored and repeated into the inputs in real time as the signals are being processed. Throw in some synthetic neurotransmitters to dampen the feedback and prevent overflow and we’re looking at a system that can feel it is feeling something and perceive what it is feeling in real time. One further insight that immediately jumps out is since the sensing relies on the real time processing of the sensations and feedbacks, the speed of signal propagation, storage, processing and repetition timeframes must all be compatible. If it is all speeded up a million fold, it might still work fine, but if signals travel too slowly or processing is too fast relative to other factors, it won’t work. It will still get a computational result absolutely fine, but it won’t know that it has, it won’t be able to feel it. Therefore… since we have a factor of a million for signal speed (speed of light compared to nerve signal propagation speed), 50 million for switching speed, and a factor of 50 for effective neuron size (though the sensing system units would be multiple neuron clusters), we could make a conscious machine that could think at 50 million times as fast as a natural system (before allowing for any parallel processing of course). But with architectural variations too, we’d need to tune those performance metrics to make it work at all and making physically larger nets would require either tuning speeds down or sacrificing connectivity-related intelligence. An evolutionary design system could easily do that for us. What else can we deduce about the nature of this circuit from basic principles? The symmetry of the system demands that the output must be an inverse transform of the input. Why? Well, because the parallel, feedback circuit must generate a form that is self-consistent. We can’t deduce the form of the transform from that, just that the whole system must produce an output mathematically similar to that of the input. I now need to write another blog on how to use such circuits in neural vortexes to generate knowledge, concepts, emotions and thinking. But I’m quite pleased that it does seem that some first-principles analysis of natural evolution already gives us some pretty good clues on how to make a conscious computer. I am optimistic that current research is going the right way and only needs relatively small course corrections to achieve consciousness. 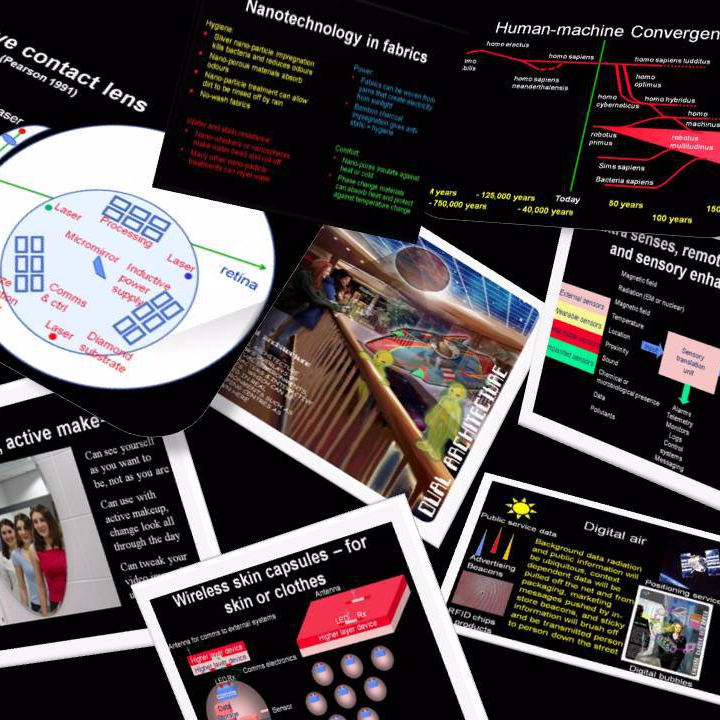 This entry was posted in AI, biomimetics, Computing, consciousness, IT, philosophy and tagged AI, consciousness, machine consciousness. Bookmark the permalink.